Photographer David Torke calls it “the third strand of Buffalo’s DNA,” along with Joseph Ellicott’s radial streets plan and Frederick Law Olmsted’s chain of parks. The Belt Line railroad running around and through the city, the transportation lifeline of the unparalleled manufacturing diversity that was the basis of the booming local economy from the 1850s to 1950s, Civil War period to just post-World War II. The Belt Line is the theme of a photography exhibit at Sugar City gallery featuring the work of five local photographers—Brendan Bannon, Max Collins, Molly Jarboe, Christina Laing, and Torke—plus a hundred or so others—amateurs or aspiring or established professionals—invited through social media to submit their Instagrams. The photos of the main exhibitors are notable for their differences of subject matters and styles and techniques, within the basic Belt Line thematic. Most different in terms of technique are Max Collins’s large-format wheat-pasted works in two photographic layers—a top layer of sometimes hard to decipher primary imagery on wrinkled and torn paper, and underlayer of yet harder to decipher secondary imagery revealed in the tear interstices of the overlayer. In one instance, two eyes in the underlayer, but not enough of the rest of the face to tell much more about whose or what. One of the overlayers is a jumble of end sections of wooden railroad ties. Christina Laing’s focus is on old industrial artifacts along the Belt Line route, old industrial forms, angle geometries of girder truss bridges, trestles, tracks, and natural world residuals—grasses, scrub bushes and trees—surrounding and pervading the industrial miscellany, ready to return and reclaim. Molly Jarboe’s focus is on the commercial and residential built environment along the route—backs of houses, backs of sheds, commercial and industrial structures and their graffiti—and itinerary view discoveries. Deer in an urban grassland abandoned area, possibly near the old Central Terminal complex. A glove on a tall vegetal stalk in an unkempt field somewhere along the way. 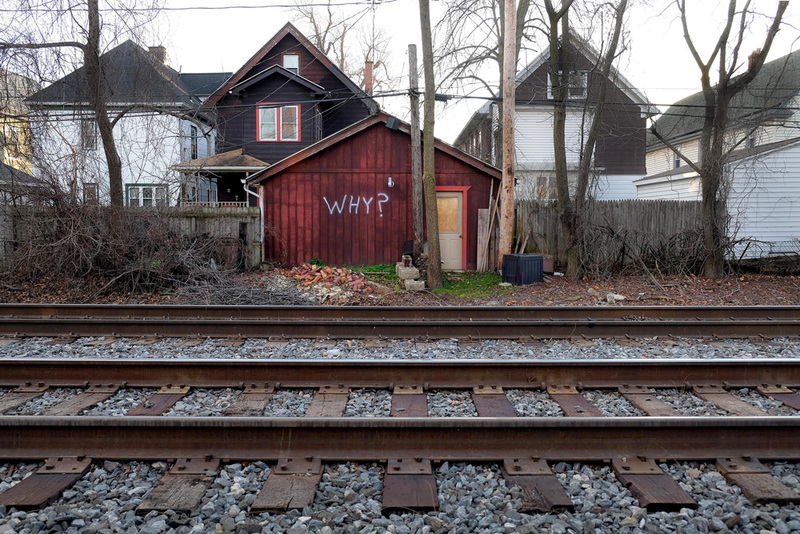 The back of a shed posing the graffiti question “Why?” to pilgrims and philosophers traveling the track. Brendan Bannon’s photos are the most oblique in terms of reference to the Belt Line. Dark and mysterious photos of industrial accoutrement of some sort—possibly remnants of line-associated factories or other buildings—but hard to impossible to identify. And basically black. Black in the center. In a recent piece I did on Impressionist and pre and post periods art at the Albright-Knox, regarding painter Gustave Courbet’s view into the sheer blackness of the mountain cave source of the Loue River in eastern France, for want of a more adequate exposition of this signally unusual work, I called it “audacious” and moved on. I would have recourse to the same strategy—and same descriptive term—for these rather essentially similar to the Courbet painting Bannon photos. Looking into the blackness. The maw of the whale. Among the hundred Instagram photos, a selection from several thousand submissions: UB city planning grad student Camden Miller’s track direction view into one of the iron girder truss bridges; Elizabeth Bragg’s diesel engine complex; Central Terminal Restoration Corporation volunteer Arthur Kogutowski’s photo of the main concourse pedestal clock from outside, through a broken window (now repaired by Restoration Corporation workers, I was told); and Melissa Crane’s word “Buffalove” on a heart graffiti mural on the west side of the Fleischmann Building on Niagara Street, since removed (the heart mural, not the building). 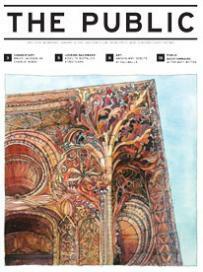 The show is called Hiding in Plain Sight and is up until January 30. Though not easy to get to see. Gallery open hours are just Fridays from 5:30pm to 7:30pm. Or during events, or by appointment, made through the website, buffalosugarcity.org.